For me this is a time to step back, to simplify, to clarify my personal truth. To pay attention to the guidance that is always within and around me, whether my awareness is focused on it or not. Trusting that things are unfolding as they are meant to, that chaos is leading us to new clarity is a challenge, but this way of being has been slowly developing for many of us over many years. We have a choice, to go to the light, or to the dark. To make our life about positivity in all ways…in our thoughts, words and actions. For much good is taking place on this planet, despite, or perhaps because of, the darkness. The searching for the light, is a good thing, because “…We are the ones we have been waiting for! !” as the words of A Hopi Elder Speaks tell us. The poem has been attributed to many people, including Thomas Banyacya Sr., (1910-1999), an Elder of the Hopi Nation. This widely adopted poem was apparently originally meant for the Hopi, however it has felt meaningful and timely since I first came across it a few years ago. The Grandmothers and their Net of Light are sending the same message, although wrapped in a different package. 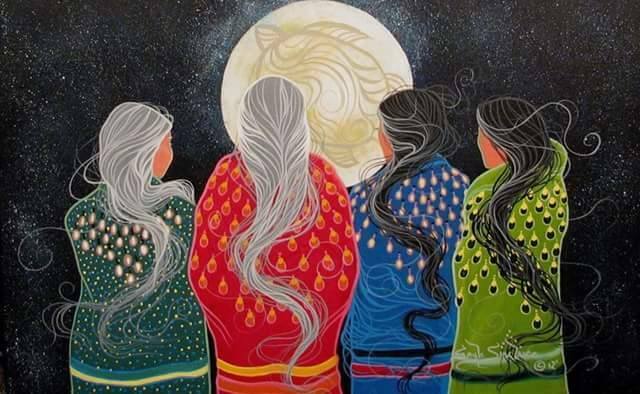 The Grandmothers are a council of ascended souls, who teach about the Net of Light, the healing net that surrounds the planet. Their message is a powerful one: they have come to help rectify the imbalance between yin and yang on this earth. They are here for any and all of us, female or male, whoever is drawn to them, folks want to both help the world and be uplifted themselves. In 2002 Nasa first saw the Net through the Hubble Telescope, and named it the Cosmic Web. This web of invisible dark matter lights up the galaxies, enabling scientists to see them better than before. Here are beautiful Hubble pics. Since my introduction to the Grandmothers and the Net a few months ago, on the surface my life has remained the same , but internally I am different…more focused, more in touch with spirit. My work with the Grandmothers and the Net harmonizes with and enhances other aspects of my life. In this current time of massive dichotomy and changes, we all have a choice – to go to the Light and create a sacred space wherever we are, or wallow in the negativity of Darkness and hopelessness. The Grandmothers picture is from a Net of Light newsletter; painted by one of the members.